A storm is coming!! What do I need to do? When the storm hits what do I do? What about when the storm has passed and the clean-up needs to be done? This iPhone and iPod touch game is aimed at middle school students between Years 5-9. It has been adapted from the Severe Storm Action Guide to help students learn what they need to do before, during and after a storm. 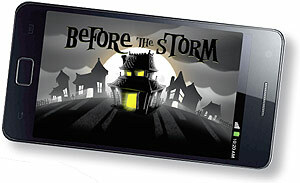 The Before the Storm – A game for iPhone & iPod touch takes place in a gothic house owned by a mad scientist ably assisted by iGor his Cyborg Lab Robot, Wolfman Elvis, The Thing, beasties and the scientist’s creature. For each stage, players have to complete a series of small tasks in order to achieve the major quest. It is expected to take somewhere between 30 and 40 minutes to play from start to finish. The game can be replayed with some amusing animations and events that the player may not spot the first time round. Before the Storm is available as a free download from the Apple-iTunes store. (If the download is too big to download you can download to your iPad or computer and then use iTunes to download to your phone).